Buy Ultrasonic Surgical Instrument Cleaning Solutions that lubricate and boost ultrasonic cleaning power. The ONEcleaner Ultrasonic Surgical Instrument Cleaning Solutions clean faster. The four enzyme detergent ultrasonic surgical instrument cleaning solutions clean residue free and cut costs. The four enzyme surgical instrument cleaning solutions deliver an average concentration that is 4 times higher than the other ultrasonic cleaning products. 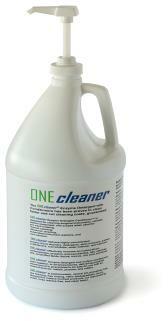 One gallon of the ONEcleaners deliver 512 gallons (1938 liters) of cleaning and conditioning power. The Ultrasonic Cleaning Solution dilution rate is .25 to .5 ounces per gallon (1.9 ml liters to 3.8 ml per liter) depending on the level of bioburden, encrustation, and stains. The 0225-1 ultrasonic surgical instrument cleaning solution cleans faster. 0225-1 ultrasonic surgical instrument cleaner solution replaces multiple products, significantly cutting shipping and inventory costs. 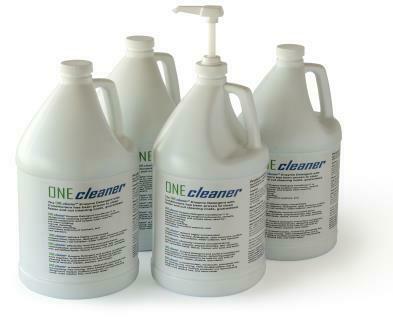 The ONEcleaners deliver the 4 enzymes that are necessary for effective cleaning: protease enzyme surgical instrument cleaning detergents, amylase enzymes, lipase enzymes, and carbohydrase enzyme ultrasonic cleaners. The ONEcleaners washer disinfector detergents quickly remove bioburden and dissolve mineral encrustation. Buy the ultrasonic surgical instrument cleaning solutions with four enzymatic cleaners, and a lubricant, that clean faster and cut cleaning costs. Clean surgical instruments, scopes, and utensils prior to sterilization faster and residue free. Contact yourCEBA for surgical instrument cleaning detergents. Go to hospital disinfectant products for non-toxic disinfectant products.